How would you reboot B5? Re: How would you reboot B5? I'm disappointed that we haven't had a continuation and resolution of Crusade in ANY form and that TNT-Atlanta hasn't been swallowed by a sinkhole. I think JMS held onto hopes of addressing that story and the telepath war on screen somehow. Now it's too late. That's why I wish we could have it in novel form, I could imagine the actors as they were in 1999. For new roles, I'd cast appropriate actors who I think would fit, e.g. Eric Etebari as Elizar in the Technomage trilogy. In the fullness of time, I guess. It's been almost 15 years since Crusade's last episode was shown in first run. Hopefully, it won't take another 15 years for the the rest of the Crusade What the HELL Happened books to come out. "Crusade" (1999) - "War Zone"
Max Eilerson: "The story of my life. I finally find a city like this, intact, deserted for ten thousand years. Probably contains hundreds of patents that I could exploit and I'm going to die. I can appreciate dramatic irony as much as the next person, but this is pushing it a bit." Given the pace and amount of projects JMS is tied into, I think it could be a while! I'm not even that fussed about the rest of the WTHH books (even the first one felt like a bit of a stretch to me, and too padded out), but those audio dramas, I definitely like to hear them. Keep in mind that the audio dramas will be for the two unproduced JMS scripts only - not new material. Yeah, they can't be new material in Babylon 5 or Crusade because Warner Brothers owns all of Babylon 5 and Crusade except theatrical movie rights. I don't know how JMS plans to reboot B5 into a movie-length feature film. 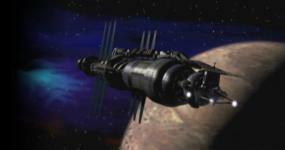 B5 was without doubt one of the best SF series ever made, but it definitely wasn’t perfect. I won’t go into the ins and outs of where I think it fell down, but we all know the show had its flaws. I mean, I kinda love those flaws too, because they’re part and parcel of the B5 experience, but flawed it was. However, the main point I wanted to make was that I don’t think a reboot would necessarily be about improving upon the old show, or putting things to right that JMS wasn’t happy with. I don’t think he’s interested in that type of ‘George Lucas-esque’ revisionism. I’m speculating here, but I think JMS would keep the basic premise and universe, but he’d be telling a different story, with twists and turns even a seasoned B5 fan wouldn’t see coming, I think JMS has too much respect for B5 for it to be a ‘do over’. Everything he’s said so far, seems to indicate something more inventive than what we consider a ‘reboot’ to be. I also tend to feel that some events left untold were meant to stay that way. When I get to really thinking about it, I’m unsure if the Telepath War would make that interesting a film or mini series. There’s not an awful lot of mystery or suspense to be had there, and I never really had any burning desire to see it explored in that much depth. If the Byron arc was anything to go by, JMS really didn’t have that much in the way of quality material relating to telepaths. IF, for instance, the Telepath War had been worked into the overall arc of B5, it might have been quite good, but the interest would lie in how it affected the crew of B5 and the station as a whole. As a stand alone entity, not so much. I did my best to re-imagine it as a central conflict in my Reboot proposal earlier in this thread. See what you make of that. Last edited by Ubik; August 27th 14 at 10:14. If there is a reboot, does that mean the whole Sinclair-becomes-Valen thing? I always found that to be one of the most amazing parts of the show. And one of the best plot twists, ever. Hard to say really... It's anyone's best guess what the arc would be. I'm still convinced JMS wouldn't be content to simply tell the same story again. Although, a LOT of his B5 themes and material does get recycled into his earlier comics work, sometimes almost verbatim.